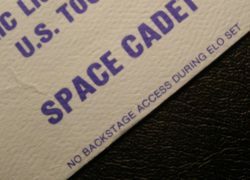 Item description: A scarce Space Cadet Pass for the 1978 USA Tour. 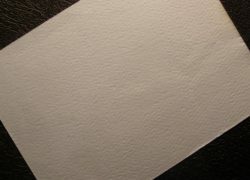 Light blue card with dark blue printing. Condition report: Excellent to near mint condition. Background to Electric Light Orchestra: The rock group Electric Light Orchestra (ELO) were formed in 1970 by songwriters/multi-instrumentalists Roy Wood and Jeff Lynne, along with drummer Bev Bevan. Their music is characterized by a fusion of Beatlesque pop, classical arrangements, and futuristic iconography. After Wood’s departure in 1972, Lynne became the group’s leader, arranging and producing every album while writing virtually all of their original material. The band was formed to accommodate Wood’s and Lynne’s desire to create modern rock and pop songs with classical overtones, deriving as an offshoot of Wood’s previous band the Move, of which Lynne and Bevan were also members. ELO were most active during the 1970s and 1980s, recording a string of studio albums that include the conceptual works ‘Eldorado’(1974) and ‘Time’ (1981). For their initial tenure, Lynne, Bevan, and keyboardist Richard Tandy were the group’s only consistent members. In 1986, Lynne lost interest in the band and ceased its operation.. In 1988, Lynne, operating under the pseudonyms Otis Wilbury and Clayton Wilbury, co-founded the supergroup Traveling Wilburys with George Harrison, Bob Dylan, Roy Orbison and Tom Petty. Although this supergroup didn’t last for long, it was extremely successful, and Lynne was highly praised for his work in bringing the various superstars together. With the exception of a short-lived reformation in 2000–01, ELO remained largely inactive for the next three decades. In 2014, Lynne reformed the band once again with Tandy, renamed as Jeff Lynne’s ELO. During ELO’s original 13-year period of active recording and touring, they sold over 50 million records, collecting 19 CRIA, 21 RIAA and 38 BPI awards. Despite early singles success in the United Kingdom, the band was initially more successful in the United States, where they were billed as “The English guys with the big fiddles”. From 1972 to 1986, ELO accumulated twenty Top 20 songs on the UK Singles Chart, and fifteen Top 20 songs on the US Billboard Hot 100. The band also holds the record for having the most Billboard Hot 100 Top 40 hits, 20, of any group in US chart history without having a number one single. 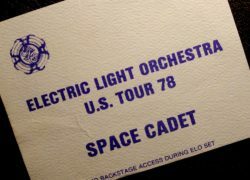 Special notes:The ELO used the term ‘Space Cadet’, for those allowed back stage. The pass states that there is no back stage admittance whilst ELO are performing.